Step into Gypsy Rose's tarot reading shop where she can look into her crystal ball to read your fortune. The slot is set in a forest, and the backdrop is Rose's old school gypsy wagon, making her fortunes available anywhere. With the carnival-esque soundtrack, there is an air of mystery with the busy nightlife in the form of insects and flowing water in the background. Rose foretells that this excellent quality Bitcoin slot is going to bring great things to your future. Gypsy Rose is a low volatility 5 reel and 30 pay line slot that works mystically well on all features. Standard symbols include a bottle of love potion, Gypsy Rose herself, magic book, crow and 10-ace icons, each presented with a twist. A crystal ball acts as the bonus symbol. The love potion bottle as the scatter symbol, which activates free spins. 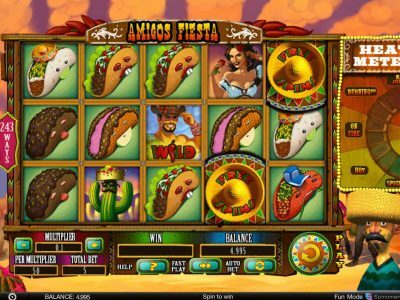 The controls blend in perfectly to the background, with Game Options and View Pays up top and the rest below: Choose Coin, Select Lines, Bet Per Line, Max Bet, Spin, Double up and Autoplay. In the center, below the middle reel are your Bet, Win, Balance and Credit displays. After each winning spin in the base game, a Double Up Mini Game is offered in which you have a simple coin toss choice. 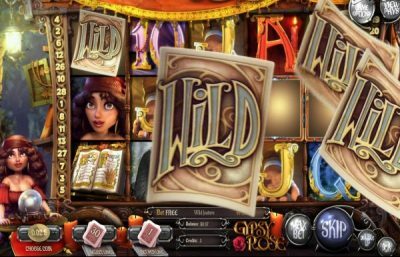 Love Potion Free Spins: 12 retriggerable free spins with a wild card that can appear in any combination, as long as a wild card is present either on reel 1 or 5 simultaneously. Magic Book Instant Win: Earn up to 20X your staked amount with this feature! Tarot Card Bonus Round: You are presented with 15 face down cards. Click on 7 of them to be awarded a win based on the matching colors and characters revealed. Crow Wild and Respin: All crow symbols become wild, and a free automatic Re-spin is issued with the wilds stuck in place. The Maximum win in Gypsy Rose is 336 000 coins! The theme is held well throughout the different aspects of this Bitcoin game. With beautifully animated characters and symbols, it is easy on the eye. Rose’s mysterious crystal ball has foretold that there are some great wins ahead! There are some tricky features, but the exotic gypsy does well to fill you in on all the tricks!